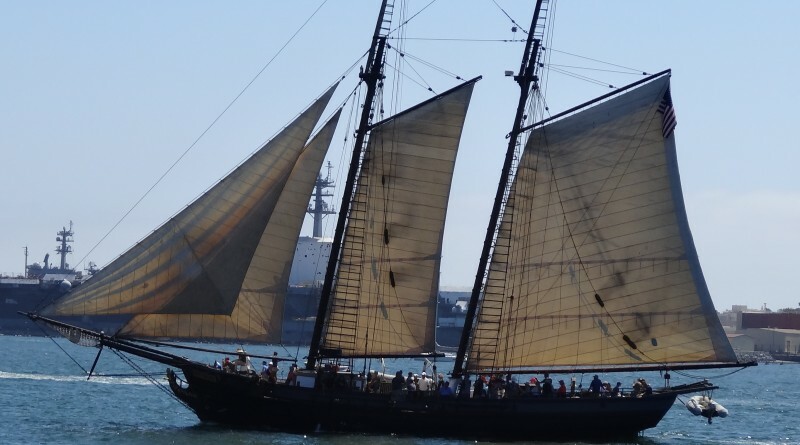 The Bill of Rights joined the Parade of Sail in San Diego Bay as a participant in this year’s Festival of Sail, sponsored by the San Diego Maritime Museum, during the Labor Day weekend. Want an opportunity to learn how to sail and maintain an old wooden sailing ship while learning from experienced craftsmen in an intimate, hands-on environment? Consider heading to San Diego’s South Bay to join the volunteer team on Bill of Rights, now docked at California Yacht Marina in Chula Vista. Best of all, whatever your skills, you’ll be making a difference in helping preserve a mid-19th century-style 136-foot gaff-rigged schooner. The all-volunteer South Bayfront Sailing Association (SBSA) had just received its official notification of nonprofit status in August 2013 when the chance of a lifetime came up: acquiring Bill of Rights, a fast schooner launched in 1971. The tall ship was at risk, stuck in a boatyard with a lien attached, when the then-operator, Channel Islands-based American Tall Ship Institute (ATSI), couldn’t raise the extra $60,000 needed to pay for unexpected dry rot repairs to the ship’s main stem. Over their head, ATSI decided to walk away. The vessel’s then-owner, the Los Angeles Maritime Institute, had leased it to ATSI for school and at-risk children’s sailing programs, but no longer wanted it. They looked for another maritime nonprofit to bail out the ship and take ownership. Enter Don Johnson and his scrappy band of volunteers. Having grown up enraptured with nautical films including “Captains Courageous” and “The Old Man and the Sea,” Johnson, who founded SBSA with his wife Susan and a determined band of South Bay sailors, was always fascinated by schooners and sailing. A former Navy Seabee, knowledgeable marine maintenance instructor, trained architect, artist and all-round Renaissance man, Johnson was intrigued by the opportunities Bill of Rights presented. “We had just formed the nonprofit to teach sailing and boating skills to the community at large, using small sailboats,” Susan said. Acquiring the schooner, built in Maine in 1971 and modeled after the 1856 schooner Wanderer, would enable their young organization to teach more sophisticated sailing and vessel maintenance skills to both adults and kids, Don explained. The ship also could provide essential support income from sailing excursions, charters, special events and tall ship festival participation. The Johnsons and their sailing buddies at Chula Vista and California Yacht Marinas took the plunge and decided to buy Bill of Rights. They passed the hat around the marinas, where friends and sailing enthusiasts dug deep into personal savings and retirement funds. Within three weeks they’d raised the money and arranged with California Yacht Marina for dockage at the excursion pier originally built for Californian. Operating, maintaining and securing the future of Bill of Rights now dominate the Johnsons’ lives. Don serves as SBSA president/CEO and first mate/engineer on Bill of Rights, while Susan, a retired IT professional, former charter captain and teacher and reluctant business manager, picks up key management roles. They and their hardy group of member/volunteers crew the boat and perform routine and major maintenance. When they acquired Bill of Rights, she was seaworthy, but her sails, decks and appearance still need attention and require additional funding. In the midst of revenue-generating sailing excursions and charters and constant fundraising, the association ensures Bill of Rights continues her long-time work with at-risk youth, as she did previously under the ownership of Vision Quest both on the east coast and later in California, where she moved about 1990. Whatever your skill set, whether manual or managerial — as long as it includes a love of the sea and ships — you’ll find a challenging experience volunteering on Bill of Rights. For more information about opportunities, visit schoonerbillofrights.com or call 619-500-2419. For “old salts” of all ages, ensuring the survival of Bill of Rights is especially rewarding. The vessel was built in 1971 which would make her a mid 20th century, not 19th century as mention in the article. Her design is from plans of schooners built in the 1800 and the materials used were those available. She is a reproduction of an 1800’s fishing schooner..
As a volunteer on The Pilgrim and The Spirit of Dana Point, I wish to express how totally great it is to be on and participate in the upkeep and well being of these ships. Getting to go out on The Spirit and actually sail it is another big plus, but even if I was never able to sail this great vessel, I’ve been most blessed in life by giving my time, skills and love into something so full of history, presents, and future. Being a volunteer on a Tall Ship makes you a better person!